You may well have heard the story circulating on Facebook that someone was spraying WD40 into the eyes of the animals at Seaview Wildlife Park yesterday. Happily that’s way from the truth. OnTheWight has just spoken to the Park’s director to find out the facts. It’s little surprise that social media platforms such as Twitter and Facebook have become the online version of Chinese Whispers – it provides the potential for a nugget of information to become exaggerated beyond recognition. 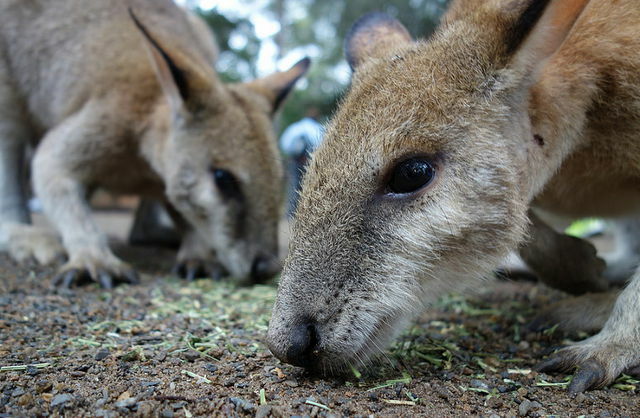 Earlier today, OnTheWight was made aware of reports that the wallabies at Seaview Wildlife Park had been “sprayed with WD40” and “hit with sticks” by someone visiting the park on Monday. Shocking news and something that would concern many, so we got in touch with the park to find out more. Lorraine Adams, a director at the park, explained to OnTheWight that a report made to them and checked out had been blown out of all proportion. She started by confirming that no animals had been hurt or sprayed – they carry out health checks twice a day on all the animals and would have noticed something as significant as this. Lorraine went on the explain that a couple sitting on a bench near the wallaby walkabout area of the park had reported seeing a young land waving a can of WD40 around. Lorraine immediately checked around the park, could not find anyone matching the description. As mentioned above, all animals were checked and there were no signs of any abuse. Lorraine was keen to make clear that had anyone been found carrying out any abuse against the animals they would have been asked to leave the park immediately. 2 Comments on "Spraying WD40 into animal’s eye at Seaview Wildlife Park: The story debunked"
It is a beautiful park I have visited many times, the standard of animal wealth always seems exemplary. A “young land” was waving a can about? Regarding the comment from Temperance, just how wealthy are these animals? Maybe you’ve both fallen foul of a spell-checker?